“O’zapft is!” Chances are you have heard of Oktoberfest. 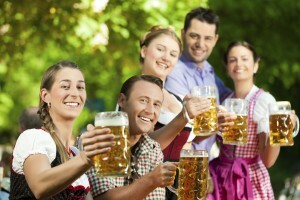 No, not the one located in your hometown, I’m talking about the original Oktoberfest in Munich! This festival is celebrating its 180th year this year! 180 years of celebrating beer? That’s right! Oktoberfest isn’t all about the beer though! The festival begins every year at 12 noon in the Schottenhamel tent, the largest tent of the festival. There are many beer tents where you can sit and enjoy your beer while you are eating the delicacies of the area. You can try Mohrenkopf, a yummy chocolate glazed, cream cake, at Café Mohrenkopf! Fischer-Vroni offers tasty treats like Steckerlfisch or fish on a stick. Hofbräu Festhalle, is a favorite of foreigners because of their welcoming atmosphere! Here, you can enjoy Wiener Schnitzel and Schweinshax`n (roast pork knuckle). Most of AESU’s summer trips include a visit to the fun city of Munich where we take the groups to Hofbrauhaus, Hofbräu Festhalle’s counterpart. Oktoberfest was created in 1810 to celebrate the Bavarian Crown Prince Ludwig’s marriage to Princess Therese von Sachsen-Hildburghausen! This year’s Oktoberfest runs from September 21-October 6. The dates for the festival change every year, as does the length. The reason for this is because October 3rd must be included every year, it’s German Unity Day! 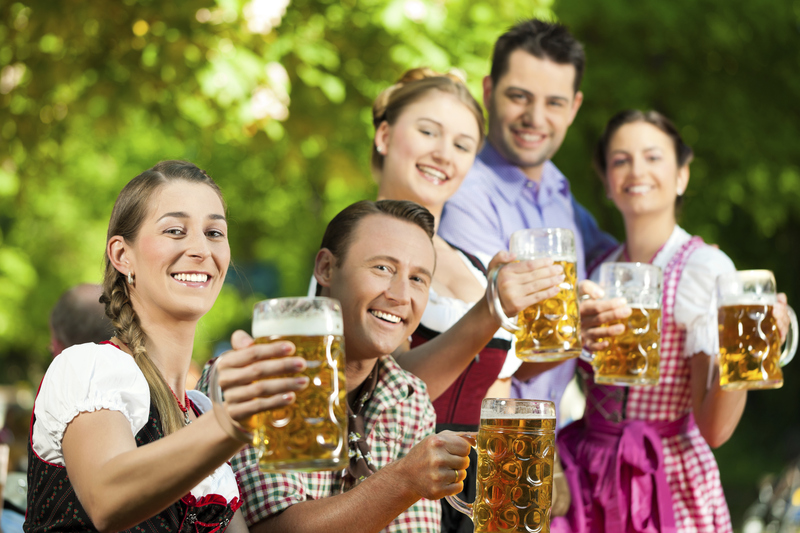 Oktoberfest is where you can truly enjoy all things German! Our 2014 trip dates have early bird discounts of up to $300 if you book and pay by October 31st. So, what are you waiting for? Travel with us on Facebook, Twitter or Pinterest. This entry was posted on Thursday, September 26th, 2013	at 12:41 pm	. You can follow any responses to this entry through the RSS 2.0	feed. Both comments and pings are currently closed.